Red-breasted Sapsucker: Ralph Hocken Photo. The Tuesday bird walk went to Springwood Park in Parksville. The morning was mostly sunny and warm. We had three sightings of Red-breasted Sapsuckers. The first sighting was of a Sapsucker gleaning insects on a short tree near the trail. He then flew right above our heads, giving us a great look. 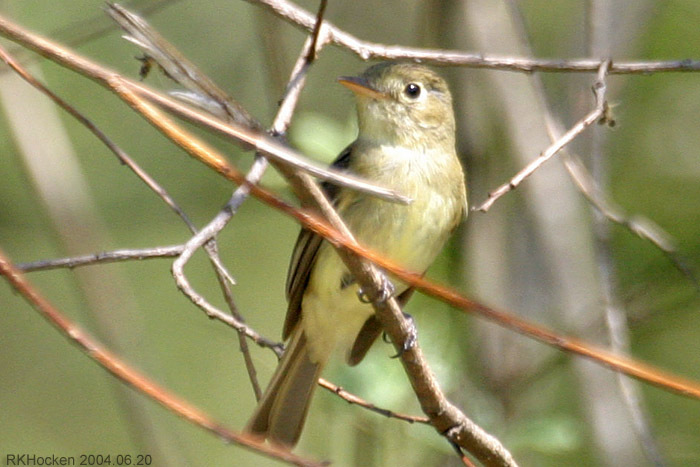 The Willow Flycatcher gave us close views as it hawked insects and then returned to it's perch several times. We heard a Cassin's Vireo and Warblers singing throughout the morning. We spotted a Black-throated Gray Warbler gleaning insects near the top of a Big Leaf Maple Tree. Fourteen birders, including Henry and Phyllis from New Zealand(who are now heading home after spending a month with us) saw and heard the following thirty-nine species of birds. Wilson's Warbler: Ralph Hocken Photo. The Tuesday bird walk , on May 29, will be going to Springwood Park in Parksville. 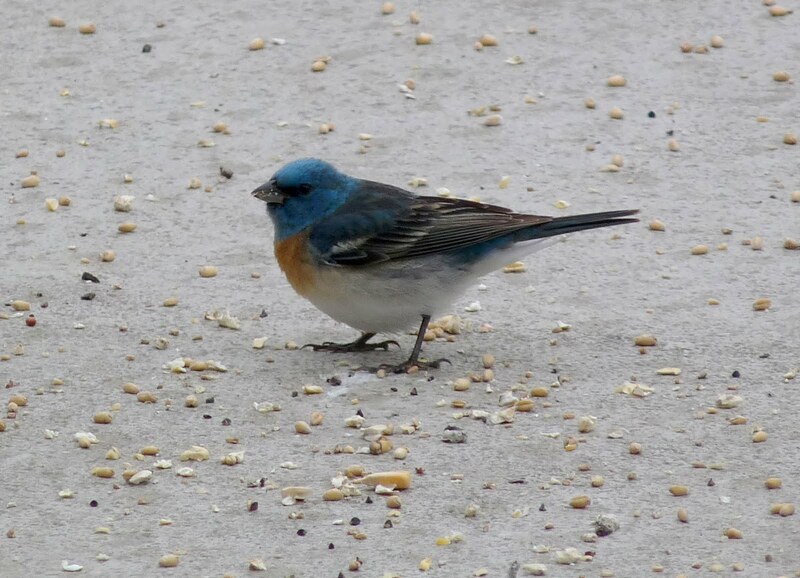 We will meet at the parking area near the Lions playground at Parksville Bay Community Park, at 9:00 a.m. or at the west end of Despard Avenue at about 9:10 a.m.
A pair of Lazuli Buntings have been reported from Chase River in south Nanaimo. They were first sighted May 25 and then again at a different backyard feeder. They are presently moving around the area of Country Hills Drive and Extension Road. Please remember, when reporting a sighting to leave your name and phone number along with the date, the species and location of your sighting. The Sunday bird walk went to Legacy / Dumont Marsh in upper Lantzville. Weather was overcast and the birds were quiet. Highlights were Wilson’s Warblers, Yellow Warble and great views of Western Tanagers. Twelve birders saw and heard the following 44 species of birds: Canada Geese, Wood Duck, Mallard, Hooded Merganser, Great Blue Heron, Sharp-shinned Hawk, Bald Eagle, Turkey Vulture, Band-tailed Pigeon, Rufous Hummingbird, Northern Flicker, Hairy Woodpecker, Pacific-slope Flycatcher, Warbling Vireo, Common Raven, Northwestern Crow, Steller’s Jay, Violet-green Swallow, Barn Swallow, Chestnut-backed Chickadee, Red-breasted Nuthatch, Bewick's Wren, Marsh Wren, Pacific Wren, European Starling, Hermit Thrush, American Robin, Yellow-rumped Warbler, Orange-crowned Warbler, Black-throated Gray Warbler, Wilson's Warbler, Yellow Warbler, Common Yellowthroat, Western Tanager, Black-headed Grosbeak, Red-winged Blackbird, Spotted Towhee, White-crowned Sparrow, Chipping Sparrow, Song Sparrow, Dark-eyed Junco, American Goldfinch,, Purple Finch, Pine Siskin. Pair of Harlequin Ducks was seen just above Second Lake of the Nanaimo lakes chain, which is located at the end of Nanaimo Lakes Road. 2 American Dippers seen under the cement bridge at upper lake at Colliery Dam Park Nanaimo. 1 Spotted Sandpiper seen at the upper lake of Colliery Dam park. Evening Grosbeaks are still visiting a feeder in upper Lantzville along with Black-headed Grosbeak. At Colliery Dam Park, a Barred Owl was heard calling, Turkey Vulture was seen overhead, and a Red-breasted Sapsucker was observed using a nesting cavity in a cedar tree next to the paved trail. Silver Pheasant was seen in a backyard on Fillinger Crescent Nanaimo. Silver Pheasant, male. Customer photo. 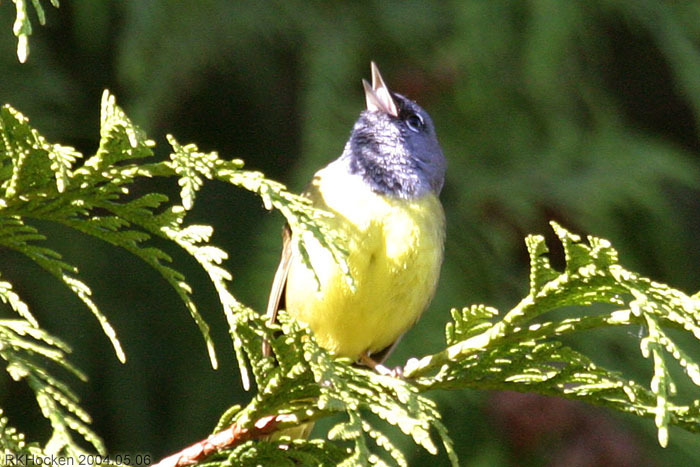 Seen at lot 10, end of Kincaid road, Qualicum Beach, Yellow-rumped Warbler, Orange-crowned Warbler, Black-throated Gray Warbler, Macgillivray’s Warbler, and Wilson’s Warbler. A family of Great Horned Owls with two adults and two downy fledglings. Also reported was an unusual male Brown-headed Cowbird that had a white cap and collar. 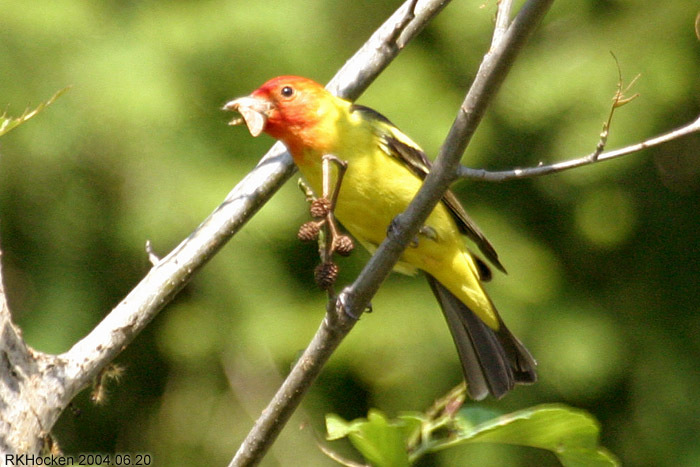 Western Tanagers have been reported at Maki road and island highway as well as Laguna Way in Nanaimo. There have also been numerous reports of the Western Tanagers as they are just returning. European Starling, Orange-crowned Warbler, Yellow Warbler, Yellow-rumped Warbler, Black-throated Gray Warbler, MacGillivray's Warbler, Spotted Towhee, Chipping Sparrow, Song Sparrow, White-crowned Sparrow, Golden-crowned Sparrow, Brown-headed Cowbird, Purple Finch, Pine Siskin. A pair of Eurasian Collared Doves was seen in a backyard on Roberta West in the Chase River area. These doves are an introduced species and are commonly being reported in the central island area. A Barred Owl was seen in the forest off Homestead Way in Ladysmith. Genevieve Singleton, Warden of the Honey moon Bay Ecological Reserve, will tell us about this beautiful place. All welcome. For more information phone 752-7588. Thursday, June 09, 7 pm in the Library on Northwest Bay Road. Everyone is welcome to join us for a 2-3 hour bird walk on the Sunday and Tuesday mornings. We leave from the Store at 9 A.M. Sunday Mornings and go to a different location in and around Nanaimo and from the Parksville Beach Community Park at 9 A.M. on Tuesdays and go to different areas in and around the Oceanside area. The Tuesday Bird Walk on May 24, 2011 will be going to the Plummer road side of the Englishman River Estuary. We will meet at the Parksville Beach, Community Park at the parking area in front of the Lions Playground at 9 A.M. or at the trail entrance about 9:10 A.M. The Sunday Bird Walk on May 29 will be going to Buttertubs Marsh. We will meet at the Birdstore at 9:00 A.M. or at the parking at the end of Buttertubs Drive off Bowen road about 9:20 A.M. The Tuesday Bird Walk on May 24, 2011 will be going to the Englishman River Estuary, Plummer Road side in Parksville. We will meet at the Parksville Beach, Community Park at the parking area in front of the Lions Playground at 9 A.M. or at the corner of Plummer Road and Shorewood Drive at about 9:10 A.M.
MacGillivray's Warbler: Ralph Hocken Photo. The Tuesday bird walk went to Rathtrevor Provincial Park in Parksville. The morning started out cool, but soon became sunny and warm making a great morning to bird. The highlights included hearing and then seeing a MacGillivray's Warbler perched and singing on the top of bushes along the trail not far from us. We watched as a Caspian Tern hovered and then dived into the ocean just past the shore line for about twenty minutes. 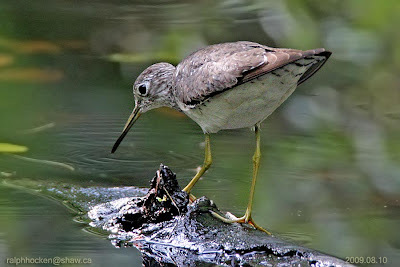 Spotted Sandpiper: Ralph Hocken Photo. Both male and female Anna’s Hummingbirds and Rufous Hummingbirds are coming to feeders on Drew Road in French Creek. The Sunday bird walk went to Morden Colliery Provincial Park in south Nanaimo and Quennel Lake in Cedar . The morning was cloudy with rain throughout the morning. The highlights included hearing Pacific Wrens, Brown Creepers, a Warbling Vireo, Common Yellowthroat, Song Sparrows. We did see a Black-throated Grey Warbler, a Yellow Warbler and a Wilson’s Warbler. Seven birders saw and heard the following forty-nine species of birds: Canada Geese, Wood Duck, Mallard, Ring-necked Duck, Pied-billed Grebe, Spotted Sandpiper, Killdeer, Great Blue Heron, Bald Eagle, Northern Flicker, Rufous Hummingbird, Pacific-slope Flycatcher, Warbling Vireo, Common Raven, Northwestern Crow, Northern Rough-winged Swallow, Violet-green Swallow, Tree Swallow, Cliff Swallow, Barn Swallow, Chestnut-backed Chickadee, Brown Creeper, Red-breasted Nuthatch, Bewick's Wren, Marsh Wren, Pacific Wren, Bushtit, European Starling, Swainson's Thrush, American Robin, Varied Thrush, Orange-crowned Warbler, Black-throated Gray Warbler, Wilson's Warbler, Yellow Warbler, Common Yellowthroat, Brewer’s Blackbird, Brown-headed Cowbird, Spotted Towhee, Golden-crowned Sparrow, White-crowned Sparrow, Savannah Sparrow, Song Sparrow, American Goldfinch,, Purple Finch, Pine Siskin, House Finch and House Sparrow. Approximately 200 Vaux’s Swifts flew down a chimney and into a home in the 900 block of Bruce Avenue in Central Nanaimo. The residents of the house had a real challenge getting the Swifts out of the house. A Black-headed Grosbeak was seen at the Living Forest Campground, off Maki Road in south Nanaimo. A Ring-necked Pheasant was spotted flying across Northwest Bay Road onto the farm yard in Nanoose Bay. 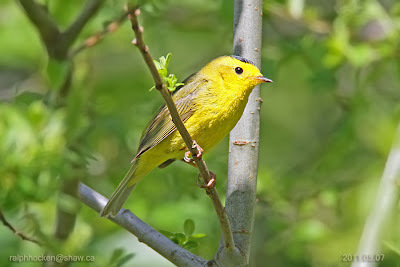 A Wilson’s Warbler was seen in a backyard in the Departure Bay Area of Nanaimo. A male Western Tanager was seen in a garden in the 300 block of 4th Avenue in Ladysmith. Two Caspian Terns were seen at Jack Point in the Nanaimo River Estuary in south Nanaimo. A Wilson’s Warbler was seen gleaning insects from cherry trees in the 2000 block of Marlborough Drive in Nanaimo. A Hammond’s Flycatcher was seen in the 2000 block of Marlborough Drive in Nanaimo. A male Cinnamon Teal and three pairs of Wood Ducks were seen at Brookwood Marsh in North Nanaimo. A Barred Owl was spotted at Buttertubs Marsh in Nanaimo. A White-throated Sparrow was seen near North Road and Ross Way on Gabriola Island. A Ruffed Grouse was seen in a yard on the north side of Taylor Walk at the Little Qualicum River Village. The Tuesday bird walk went to the Englishman River Estuary, Shelly Road side in Parksville. The morning was cloudy and very windy. The highlights included seeing an Osprey fly over head. We saw and heard five species of warblers ---Orange-crowned Warbler, Yellow-rumped Warbler, Black-throated Gray Warbler, Common Yellowthroat and a Wilson's Warbler. Anna's Hummingbird, Rufous Hummingbird, Belted Kingfisher, Northern Flicker, Pileated Woodpecker, Northwestern Crow, Common Raven, Violet-green Swallow, Chestnut-backed Chickadee, Bushtit, Red-breasted Nuthatch, Bewick's Wren, Pacific Wren, Ruby-crowned Kinglet, American Robin, European Starling, Orange-crowned Warbler, Yellow-rumped Warbler, Black-throated Gray Warbler, Common Yellowthroat, Wilson's Warbler, Spotted Towhee, Chipping Sparrow, Savannah Sparrow, Song Sparrow, White-crowned Sparrow, Dark-eyed Junco, Brown-headed Cowbird, Purple Finch and House Finch. Male and female Brown-headed Cowbirds were seen at a feeder along Homestead Way in Ladysmith. A Mourning Dove that has been hanging out in the area of Cosgrove Crescent and Argyle Avenue in Nanaimo. 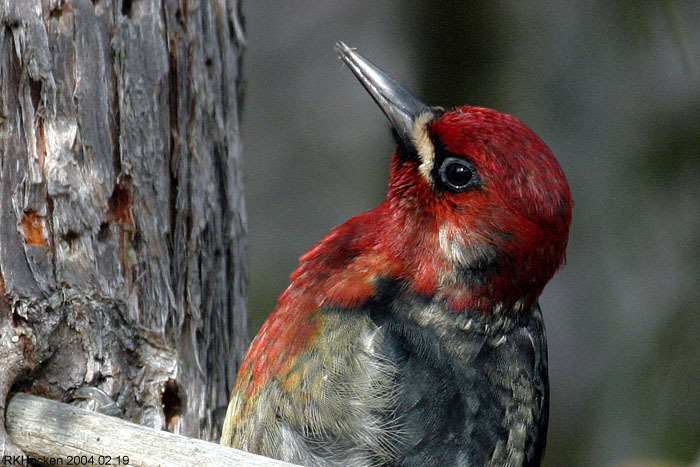 A Red-breasted Sapsucker was spotted feeding on a peanut feeder in a backyard along Woodland Crescent in Port Alberni. Monday May 30, 7.30 pm at Springwood School in Parksville. The Tuesday Bird Walk on May 17, 2011 will be going to the Rathtrevor Provincial Park in Parksville. We will meet at the Parksville Beach, Community Park at the parking area in front of the Lions Playground at 9 A.M. or at the main parking lot of Rathtrevor Provincial Park about 9:10 A.M.
Western Tanager: Ralph Hocken Photo. The Tuesday Bird Walk on May 17, 2011 will be going to Rathtrevor Provincial Park in Parksville. We will meet at the Parksville Beach Community Park at the parking area in front of the Lions Playground at 9 A.M. or at the main parking lot at Rathtrevor Provincial Park. at about 9:15A.M. 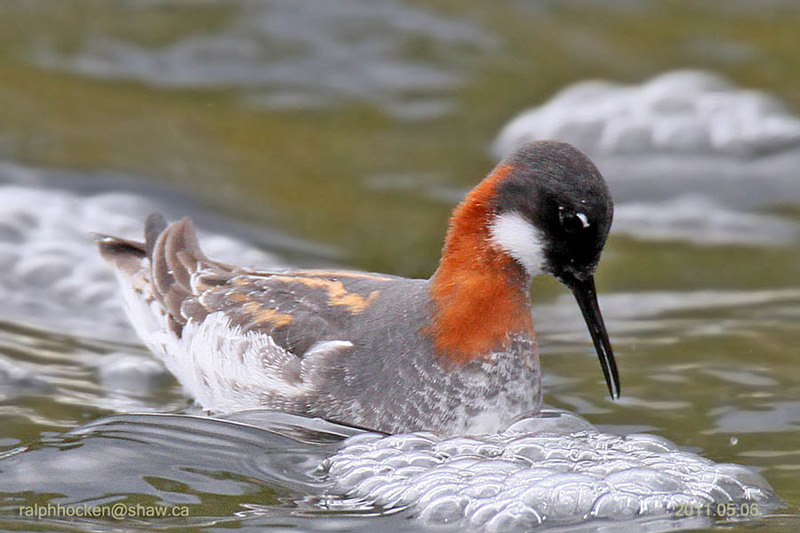 Red-necked Phalarope: Ralph Hocken Photo. The Sunday bird walk went to the Englishman River Estuary in Parksville. The weather was sunny with calm winds. We saw and heard Orange-crowned Warblers, Yellow-rumped Warblers, Yellow Warblers, Wilson’s Warblers, Townsend’s Warblers, Black-throated Gray Warblers and Common Yellowthroat throughout the morning. Black-throated Gray Warbler, Common Yellowthroat, Ruby-crowned Kinglet, Golden-crowned Kinglet, Spotted Towhee, Savannah Sparrow, Song Sparrow, White-crowned Sparrow, Golden-crowned Sparrow, Dark-eyed Junco, Red-winged Blackbird, Brown-headed Cowbird, Purple Finch, House Finch, American Goldfinch and Pine Siskin. A Black-headed Grosbeak was spotted flying across Highway 19, just past Woodgrove Shopping Centre in Nanaimo. Two California Quail were seen in a backyard along Pelican Way in Nanaimo. 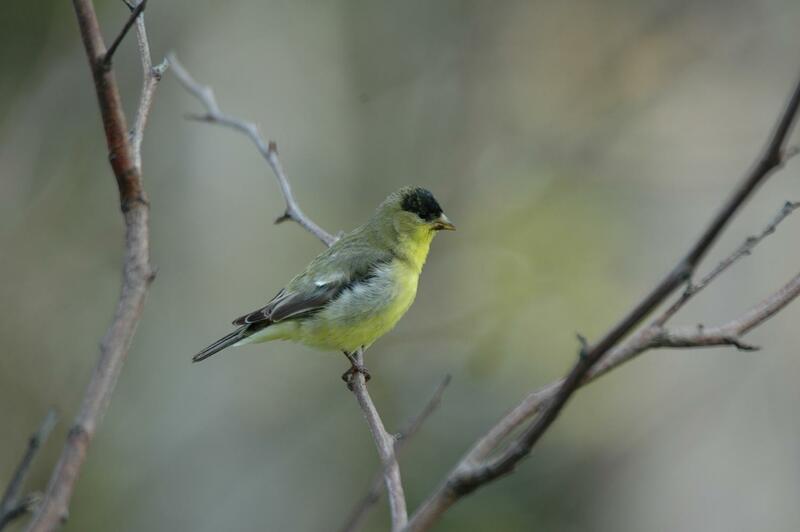 American Goldfinch are visiting feeders along Cedar Road in Cedar. A Townsend's Solitaire was perched on a fence at the top of Colbourne Drive in north Nanaimo. A Yellow-headed Blackbird has been seen at the Little Qualicum River Estuary. The lone bird was seen moving about the yards of the houses along Surfside Drive in Qualicum Beach. A Great Blue Heron was spotted on the roof of a house along Hamilton Avenue in Nanaimo. Black-bellied Plovers were seen along the tide line at Pipers Lagoon. Great Horned Owls with chicks were seen at Yellow Point Park in Cedar. A Red-necked Phalarope, a Lincolns Sparrow, several yellow-rumped Warblers, Violet-green Swallows, a Northern Rough-winged Swallow and a Barn Swallow were seen at Morningstar ponds near the pump house off Lee Road in French Creek/Parksville. A Mountain Bluebird is still being seen at Piper’s Lagoon in Nanaimo. American Goldfinch were seen visiting feeders along Vancouver Avenue in Nanaimo. The Tuesday bird walk went to the Top Bridge Trail in Parksville. It was a great morning for birding with sunny skies and calm winds. The highlights included seeing a Pacific-slope Flycatcher fly catching and gleaning insects. Several Chipping Sparrows perched on top of bushes along the trail entertaining us with their courting songs. A Hutton's Vireo showed up giving us looks. We spent most of the morning watching and hearing a large flock of Yellow-rumped Warblers that included both sub species of Myrtle and Audubon feeding on the ground and bushes along the trail at the top of the pond. We caught sight of a Lincoln's Sparrow perched on a short bush. Sharp-shinned Hawk, Merlin, Killdeer, Rock Pigeon, Band-tailed Pigeon, Anna's Hummingbird, Rufous Hummingbird, Northern Flicker, Pileated Woodpecker, Pacific-slope Flycatcher, Hutton's Vireo, Northwestern Crow, Common Raven, Tree Swallow, Violet-green Swallow, Chestnut-backed Chickadee, Red-breasted Nuthatch, Brown Creeper, Bewick's Wren, Pacific Wren, Ruby-crowned Kinglet , American Robin, European Starling, Yellow-rumped Warbler, Orange-crowned Warbler, Black-throated Gray Warbler, Townsend's Warbler , Spotted Towhee, Chipping Sparrow, Song Sparrow, Lincoln's Sparrow, White-crowned Sparrow, Golden-crowned Sparrow, Dark-eyed Junco , Brown-headed Cowbird, Purple Finch , House Finch, Pine Siskin and American Goldfinch. Three Wilson’s Snipe are frequenting a backyard along Dover Road in Nanaimo. Thursday, May 12, 7 pm in the Library on Northwest Bay Road. A talk and slide presentation by Jay Rastogi: Sustainable Forest Stewardship at Wildwood Farm. Monday May 16, 7.30 pm at Springwood School in Parksville. The Tuesday Bird Walk on May 10, 2011 will be going to the Englishman River Estuary, Shelly Road side in Parksville. We will meet at the Parksville Beach, Community Park at the parking area in front of the Lions Playground at 9 A.M. or at the end of Shelly Road (off highway 19a on the Oceanside) at about 9:10 A.M. The Sunday Bird Walk on May 15 will be going to Morden Collery in Provincial Park in south Nanaimo. We will meet at the Birdstore at 9:00 A.M. or at the parking area at the Morden Park at about 9:30 A.M. Turn east off the Trans-Canada Highway at Morden Road. Follow Morden Road through the four-way stop and then follow the Provincial Park sign to the left of Morden Road. Departing Bamfield Saturday, May 21, 2011 6:30 a.m. This trip is an off-shore pelagic trip targeting migrating seabirds and off-shore specialties such as albatrosses, shearwaters and storm-petrels. 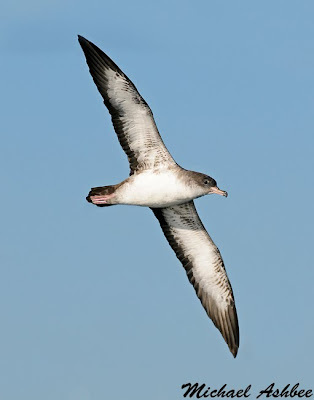 Pink-footed Shearwater: Mike Ashbee Photo. Departing Bamfeild Saturday, May 21, 2011 6:30 a.m.
YELLOW-HEADED BLACKBIRD has been seen at the Little Qualicum River Estuary. The lone bird was seen moving about the yards of the houses along Surfside Drive. Pacific-slope Flyatcher: Ralph Hocken Photo. 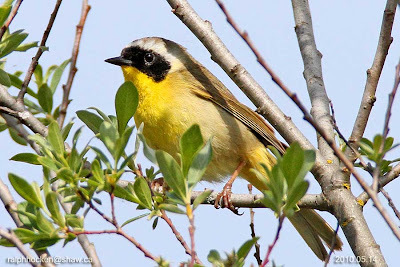 Common Yellowthroat: Ralph Hocken Photo. The Sunday bird walk went to Legacy Marsh in upper Lantzville. The weather was sunny with calm winds. The morning was full of warbler songs. 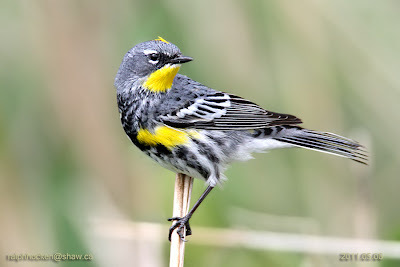 We watch a large fall out of Myrtle sub species Yellow-rumped Warblers. There were several Orange-crowned Warblers, Townsend’s Warblers, Black-throated Grey Warblers, Common Yellowthroats Warblers and a McGillivray’s Warbler that we saw and heard throughout the morning. We heard the songs of at least two Pacific-sloped Flycatchers. Seventeen birders saw and hear the following forty-one species of birds: Canada Geese, Mallard, Great Blue Heron, Wood Duck, Turkey Vulture, Bald Eagle, Merlin, Red-tailed Hawk, California Quail, Rufous Hummingbird, Red-breasted Sapsucker, Northern Flicker, Steller’s Jay, Common Raven, Northwestern Crow, Violet-green Swallow, Tree Swallow, Barn Swallow, Chestnut-backed Chickadee, Marsh Wren, Bewick's Wren, Pacific Wren, Red-breasted Nuthatch, Ruby-crowned Kinglet, American Robin, European Starling, Orange-crowned Warbler, Townsend’s Warbler, Black Throated-grey Warbler, McGillivray’s Warbler, Yellow-rumped Warbler, Common Yellowthroat, Pacific-sloped Flycatcher, Spotted Towhee, White-crowned Sparrows, Chipping Sparrow, Song Sparrow, Brown-headed Cowbird, Red-winged Blackbird, Purple Finch and Dark-eyed Junco. An American Kestrel was seen flying into the woods behind Thrifty’s Grocery Store in Parksville. A Chipping Sparrow was spotted along Mulholland Drive in Parksville. A Yellow-headed Blackbird was seen at Hardy Bay Road and Devon Place in Port Hardy. The Tuesday bird walk went to Springwood Park in Parksville. The morning was mostly sunny with a few clouds and calm winds. A male Anna's Hummingbird perched next to the trail giving us nice views at the beginning of the walk. We heard three Cassin's Vireos singing in the forest. We watched as four Red-breasted Nuthatches played on a tall conifer tree. Several Townsend's Warblers moved about high up in the Alder Trees. Throughout the morning we saw Orange-crowned Warblers gleaning insects and Yellow-rumped Warblers fly catching. A Red-tailed Hawk was perched on the big hydro lines for a good part of the morning. Our hearts were warmed by the sight of a female Mallard slowing crossing the road with ten Mallard Chicks following closely behind. Townsend's Warbler, Spotted Towhee, Song Sparrow, White-crowned Sparrow, Dark-eyed Junco, Purple Finch, House Finch, Pine Siskin and American Goldfinch. A Yellow-rumped Warbler was seen at the Brookwood Pond in Nanaimo. Two Northern Mockingbirds were seen and photographed at the top of Notch Hill in Nanoose Bay. A Lincoln’s Sparrow was seen on the bushes near the Morningstar Ponds in Parksville. The Tuesday Bird Walk on May 03, 2011 will be going to the Top Bridge Trail in Parksville. We will meet at the Parksville Beach Community Park at the parking area in front of the Lions Playground at 9 A.M. or at the parking area along Indrustrial Way near Tuan Road at about 9:10 A.M. The Sunday Bird Walk on May 08 will be going to the Englishman River Estuary, Shelly Road side in Parksville. We will meet at the Birdstore at 9:00 A.M. or at the end of Shelly Road (off highway 19a on the Oceanside) at about 9:30 A.M.
After 5 years in Bamfield we moved out to Newfoundland, but we still love getting your email updates! Anyway, we are coming home for May, and hoping to keep our tradition of a mid-May pelagic trip out of Barkley Sound going. Last year we had a bit more local interest that usual and we had a great day in a charter fishing boat we rented from our friend and took out to Swiftsure Bank, La Perouse Bank and beyond. Highlights included drifting among a group of over a hundred of humpbacks with thousands of Sooty Shearwaters streaming by, tens of thousands of migrating phalaropes, Sooty, Short-tailed and Pink-footed shearwater, Tufted Puffin, Cassin's and Rhinoceros Auklet. etc....Other years we have seen Buller's and Flesh-footed Shearwater, Arctic Tern, Northern Fulmar, flocks of Sabine's Gulls, Ancient Murrelet, Brown Pelican and other great birds. Obviously the more people, the cheaper the individual cost, and ultimately, the larger the boat that can be chartered, and the further it is possible to go! I was wondering if you would be willing to post an 'ad' to let interested birders know that they could get in touch with me if they would like to participate in something like that. Basically a FULL day on the water in a smaller boat that would travel out to the La Perouse Bank, Barkely Canyon area or somthing similar. Target species would be albatrosses and other deep water seabirds. Last year the cost worked out to around $140 per person all in, and hopefully that might even come down with more people, on the other hand, if there is interest in chartering a larger faster boat, the cost could be slightly higher. The cost of the trip is strictly to cover charter and fuel, I am not making any profit on this at all - I just want to see good birds with good people! The trip would leave from Bamfield in the morning on a day with good weather and calm seas sometime between May 13-16 or so. People can email me at: mark.maftei@gmail.com for details or more info. If you can spread the word, it would be much appreciated! Lesser Goldfinch: Cathy Carlson Photo.